School psychology graduate students and faculty attended 2019 NASP Conference. The 2019 National Association of School Psychologists (NASP) Convention was held Feb. 26 through March 1 in Atlanta. Courtney Holley, Ed.D., president of the Georgia Association of School Psychologists and a Georgia Southern University alumna, spoke at the convention to welcome attendees to Georgia. Holley earned a bachelor’s in psychology as well as master’s and specialist degrees in school psychology from the University and currently serves a school psychologist in Cook County Schools. 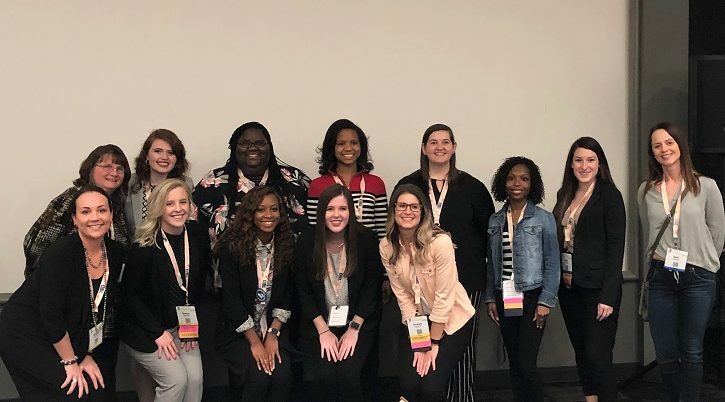 Brittany Fahey and Raven Hamilton, NASP student leaders for Georgia Southern’s school psychology program, along with Diamanduros, participated in the NASP Student Leaders and Faculty Sponsor meeting held by the NASP Graduate Student Committee. Approximately 20 current students in the program attended the NASP convention.